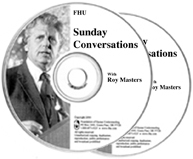 Once again, Roy Masters goes where few have dared to tread. This radio host of the national Advice Line radio show holds nothing back in pursuit of the truth. Be prepared, you’re going to hear things said here you will hear nowhere else, on subjects few dare to broach. This is a talk you may want to listen to multiple times, as it is its subtlety that makes it so compelling. Roy is direct, but he doesn’t do all the work for you. Before viewing the talk, may we suggest you visit www.AntidoteForAll.com to listen to the complimentary 7-minute awareness technique. The awareness you bring to this talk will be rewarded. Some of the subjects covered this week? Your purpose of life; suffering; dealing with intimidation; meditation; salvation; the real meaning of paying-it-forward; cancer; and what’s behind our loyalty to our bullies. You can listen to Roy’s Advice Line radio show on www.fhu.com.